Males are smaller and more slender than females. Will nibble on corals and not safe with other invertebrates such as small hermit crabs and other shrimp. Do not keep with aggressive fish that may eat shrimp. A scavenger by nature, prefers meaty foods. Will remove dead tissue, algae and parasites from larger fish. Will even pick at hands that are trying to clean the tank! As this shrimp is a scavenger, it will need to have various foods on offer at all times or else it may starve. It is also nocturnal and will only really feed at night. Nocturnal, so needs a cave to hide in during the day. This is a cleaner shrimp so will approach large fish to pick off dead tissue and parasites. A slender shrimp with very long legs, pincers and antennae. 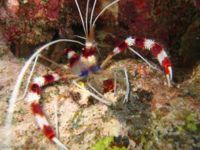 The shrimp is banded down its body and legs with white and red/brown, which makes it a striking addition to any saltwater tank. This page was last edited on 8 August 2011, at 11:49.